The Census impacts everyone living in the United States. 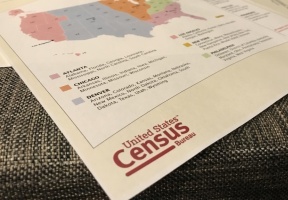 Even though the upcoming Census is two years away, there is urgency to begin strategizing for outreach in hard to count communities to ensure a complete count. An inaccurate count can lead to disastrous outcomes for Illinois because federal funding tied to Census numbers is critical for social services like SNAP, Medicaid, Section 8, and LIHEAP. This is why a group of local elected officials and civic organizations led by Cook County Commissioner Jesús “Chuy” García, and in partnership with Forefront, kicked off the first “Count Me In” community briefing in Illinois at SEIU Healthcare. Other partners include Cook County Commissioner Stanley Moore, State Representative Theresa Mah, Alderman Gilbert Villegas, Alderman Roderick Sawyer, Chicago Urban League, MALDEF, Illinois Coalition for Immigrant and Refugee Rights, the Illinois Business Immigration Coalition, and the Institute for Work & the Economy. An inaccurate Census count will also have a disparate impact on the country’s political representation. According to Cook County Commission Stanley Moore, who helped co-host the event, “the outcomes of the Census Count can and will affect reapportionment, redistricting, demographic data, and government resource allocation.” Cook County Commissioner Jesús “Chuy” García emphasized the following to attendees: “We need to work collectively to be strategic in how we conduct outreach that is inclusive, yet keeps our communities safe. Now, more than ever, we must ensure that the voices and presence of the people we serve are acknowledged and prioritized.” In regards to the chilling effect the potential citizenship question may have on immigrant communities, Celina Villanueva from the Illinois Coalition on Immigrant and Refugee Rights added an organizer’s perspective by adding “We have been telling our communities to not open the door (in reference to ICE), now what do we tell them to make sure they are counted?” adding that $19 Billion in federal funds allocated to Illinois are at stake. The Briefing took place Friday, June 15th at SEIU Healthcare, located at 2229 S. Halsted, Chicago, IL 60608.